What is the proper etiquette for a promise ring? While promise rings are a relatively new trend that has rapidly been accepted by many couples, there is appropriate promise ring etiquette that should be followed when presenting, wearing, and following through with this symbolic piece of jewelry. Promise rings have been used for decades between couples who want to make a stronger commitment to one another than just dating but for whom a full engagement is not appropriate or feasible. Modern promise rings, however, can have many different uses. Promise ring meanings can vary from a romantic commitment to an oath to break a bad habit to upholding spiritual vows or chastity. Today, couples may wear matching promise rings to show their connection to one another, and promise rings can even be exchanged between friends or families. No matter what the type of promise ring or the vow it represents, however, there is proper etiquette that should be observed. Because promise rings have much more variety than engagement rings, there is more flexibility in the rules of etiquette. At the same time, certain conventions should be followed and these etiquette guidelines can help anyone considering giving or wearing a promise ring make the most of the vow without embarrassment or misunderstandings. It is inappropriate for anyone to expect to be given a promise ring at a particular stage in their relationship. Every couple's needs are different, and some couples may be together for a very short period of time before deciding on a stronger commitment, while other couples may need much longer to feel comfortable with that next step. When a couple does decide to consider exchanging promise rings, they should discuss what that promise would mean and be clear about the commitment they are making to one another. Communication is essential to ensure that both parties are aware of what the ring will symbolize and they can decide together if they are ready for that step. Giving someone a promise ring is a special moment, but it should not be confused with a marriage proposal. It is not appropriate to present a promise ring on bended knee, or to arrange a tremendously elaborate event to make the promise. A simple, heartfelt declaration is sufficient, though different romantic elements such as a candlelit dinner or flowers can be included. For religious promise rings, a church ceremony where the ring is presented and the promise is declared is often arranged. Other popular ways to present promise rings include reciting or reading promise ring poems, giving the ring as a birthday or holiday gift, or sharing the ring on a day significant to the couple's relationship, such as the anniversary of the day they met. Promise rings can be worn on either the left or the right hand. If the promise ring is the precursor to an engagement ring, it is usually worn on the left hand until the engagement ring is worn, but if the promise is not romantic the right hand is the more appropriate choice. In some cases, such as an inaccurate ring size, the ring can also be worn on a chain around the neck instead of on the hand. 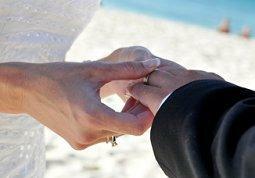 No matter how the ring is worn, it is poor promise ring etiquette to flash it about. While a woman may want to show off her engagement ring, it is less considerate to do so with a promise ring because the commitment the promise ring represents is less formal than any engagement ring symbolism. Couples should keep their promises. Once a promise is fulfilled - an engagement ring is presented, a habit is broken, a relationship is changed - the promise ring can still be worn either continuously or occasionally as a reminder of that oath. Some women will switch hands for their promise ring, particularly if they have received an engagement ring, while others will retire the promise ring only to be worn occasionally. If a promise is broken, it is proper to return the promise ring just as a couple would return an engagement ring in the case of a broken engagement. If neither individual wants to keep the ring it could be sold and the money split. Different states have different laws regarding valuable gifts and what to do if the relationship ends, however, and couples who exchange expensive promise rings will want to investigate the appropriate action if the promise is broken. Promise ring etiquette, while more casual than engagement ring etiquette, provides a guideline for couples who want to make a stronger commitment to one another in a meaningful and appropriate way. Politeness, communication, and responsibility are always essential for proper etiquette, and couples who practice all three will be able to make - and keep - promises with one another.